Experience dynamic resistance rope training with the Marpo VMX THREE60 Rope Trainer. 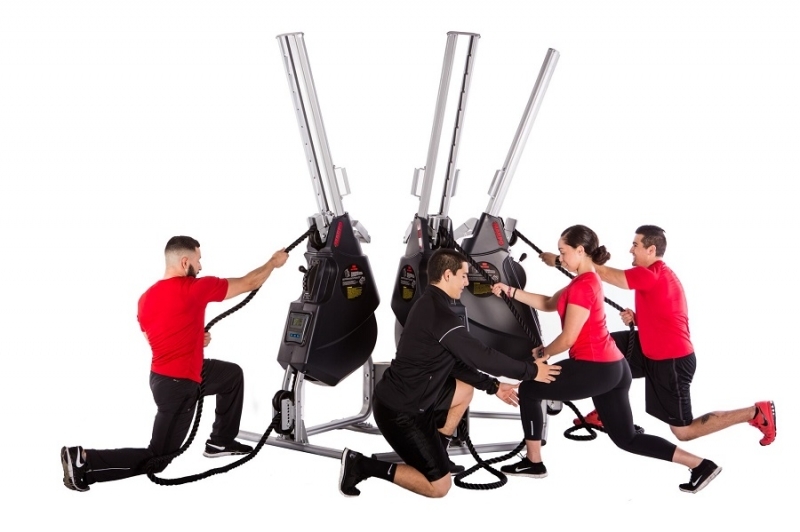 This multi-user, multi-mode, multi-functional training system allows for competitive team challenges, multi-user training sessions, full body strength, power and/or endurance workouts. The Dynamic Magnetic Braking (DMB) System builds functional grip strength through dynamic grip and re- grip patterns and consistently provides optimal resistance that can be adjusted for endurance, strength, power or combination training. The rope angle can also be adjusted to provide an array of functional movement patterns - push, pull, squat, lunge, bend and rotate. The VMX THREE60 Rope Trainer is a weight-assisted model that simulates actual rope climbing. The levitating seat moves with the user for instant feedback and a true climbing experience that engages the entire core, back, arms and grip. The weight-assist offsets body weight to allow those of all fitness levels to benefit from this uniquely effective exercise. Features a quick-release seat to allow for lower body, standing exercises and wheelchair accessibility. The VMX THREE60 Rope Trainer delivers an exceptional strength and cardio conditioning workout that is as intense as it is safe. Call 1-800-875-9145 to speak with one of our fitness advisors with any quesitons you may have. 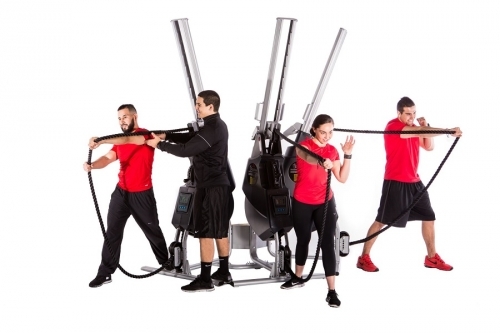 Order your Marpo VMX THREE60 Rope Trainer from Fitness Zone.com today! Marpo Kinetics was founded in 2006 by Marius Popescu, an engineer by profession and former competitive judo athlete and coach with a life-long passion for sports and fitness. His athletic career includes having had the honor of competing for 13 years on the US National Judo Team, earning numerous US National and Collegiate titles and as a member of the 1993 World Championship Team and the 1996 US Olympic Team. After retiring from competition, Marius coached at San Jose State University where he still continues to train and help promote the sport of Judo. Having trained with climbing ropes throughout his competitive years, Marius fully understood the value of this imposing training modality. It became his mission to bring the benefits of rope training to those of all fitness levels. The result is a line of functional and effective exercise equipment that does much more than serve as a rope climbing alternative. Developing the first functional prototype from his home garage, Marius worked with kinesiologists to create the comprehensive exercise protocols that have been praised by fitness practitioners worldwide. "Our Rope Trainers are all about delivering an intense and effective workout without compromising safety. Whether the goal is to build strength, endurance or cardiovascular conditioning, Marpo Rope Trainers are functional training powerhouses" says Marius. Today, Marpo Rope Trainers are used in gyms, rehabilitative centers, and fitness facilities of all sizes in over 30 countries around the world. Each model is capable of delivering a more efficient calorie burn over traditional cardio trainers while also providing a strength workout that can outperform an entire suite of fixed movement machines. 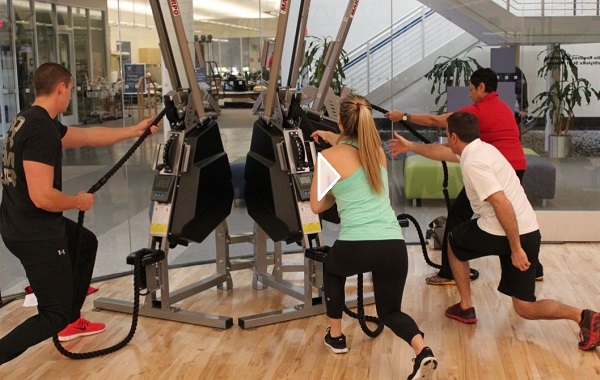 Whether training professional sports teams or helping gyms retain and motivate members, Marpo Rope Trainers have proven to be some of the most versatile and highest-performing machines available anywhere. 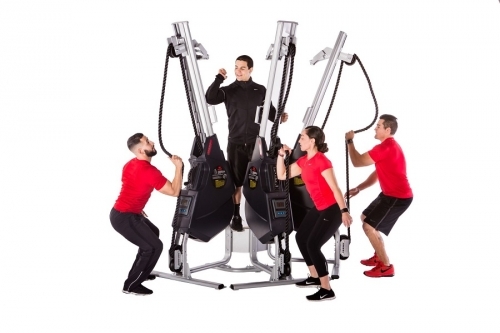 A multi-user, multi-mode, multi-functional training system; a turn-key solution providing a fully adaptational cross training experience with ease-of-use and safety in one dynamic workstation. Using sets of three 60-second work periods as the building blocks of workouts and programs, the Three60 series combines functional movements with varied speeds and workloads to emphasize endurance, strength, power or a combination of all three. The Marpo VMX Three60 with Three60 Training achieves total body fitness with the dynamic intensity and safety of Rope Training. • Sliding carriage enables quick and easy rope mode changes: Vertical, Diagonal, Horizontal rope orientations. Order your Marpo VMX THREE60 Rope Trainer from FitnessZone.com today!